Click Here to Download PivotPal Today! There is no doubt that pivot tables are incredibly powerful, and save us a lot of time when summarizing data. However, we also spend a lot of time doing repetitive tasks with pivot tables. Do you spend extra time doing any of the following? These small tasks can be very time consuming and frustrating! Do You Spend Extra Time Building Pivot Tables? If you use pivot tables frequently then you could be wasting a lot of time with some of these boring repetitive tasks, which takes time away from the fun stuff. If you have pivot tables with more than 20-30 fields, then just scrolling through the field list to find the field you're looking for can take a lot of time. Find the sheet that contains the source data. Scroll horizontally through the columns until you find the field. Go back to the sheet that contains the pivot table. Find the field name in the field list. Add it to the pivot table. REPEAT for all the fields you want to add. This process alone can be very time consuming. How Can We Make This Faster? And, I have probably built thousands of pivot tables. I use pivot tables for everything from a quick list of unique values, to reconciling accounts, to creating sophisticated interactive dashboards. They have a seemingly infinite number of uses, and they are just awesome! When you start using pivot tables frequently, you begin to realize that some of Excel's built-in tools could be a little more efficient. There are certain tasks that just take way too much time with the built-in field list and various options menus. Fortunately, VBA (the language used to write macros) allows us to program pivot tables to help automate some of these tasks. Over the years I have written a lot of macros that perform specific tasks to modify or update a pivot table. However, I wanted to bring these automation routines into an application that everyone could use. This is where the PivotPal add-in was born. PivotPal started as a simple form with a search box where you could quickly find a field in the field list, then add it to one of the areas in the pivot using keyboard shortcuts. That feature alone saved me a ton of time. But the features quickly grew from there… I also wanted a way to quickly format numbers, instead of having to navigate through four menus just to change a number format. I also wanted the ability to work on the pivot table from the source data sheet. Why should we have to constantly jump back and forth between two sheets that might not be located next to each other in the workbook? The list goes on, and I spent over a year adding features to enhance PivotPal. The goal of PivotPal is to save you a ton of time when working with your pivot tables. The add-in is packed features that make things faster and easier. Let's take a look at some of the features. 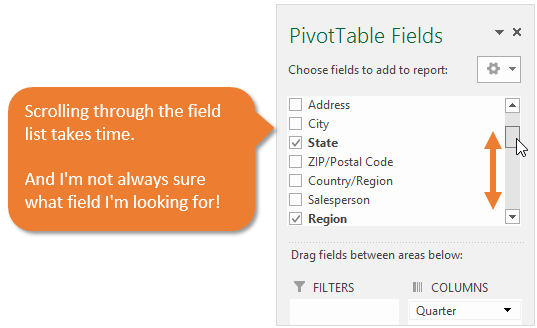 PivotPal contains a search box that allows you to quickly find fields in the field list. It works similar to a Google search, and the results are narrowed down as you type. Once you find the field, you can use keyboard shortcuts or the mouse to add the field to any of the areas in the pivot table. You will never have to spend time scrolling through the field list again. You can also select multiple fields in the list to quickly add or remove fields, and even change number formatting. When formatting a number in the values area you typically have to step through 4 menus just to change a number format. There is no doubt that this takes extra time. PivotPal contains a few features that relieve a lot of pain with this process. First, PivotPal automatically applies number formatting. When you add a field to the values area with PivotPal, the number formatting for the field in the source data is detected and automatically applied to the pivot table. This means you have to take zero steps to format the field. It's automatically done for you! If you the source data is not formatted, or you want to change the formatting of the field, you can do so in one step by selecting from the list of formats in the Formats drop-down menu on the PivotPal window. This list of number formats can be easily customized using the My Number Formats tool that is included with PivotPal. 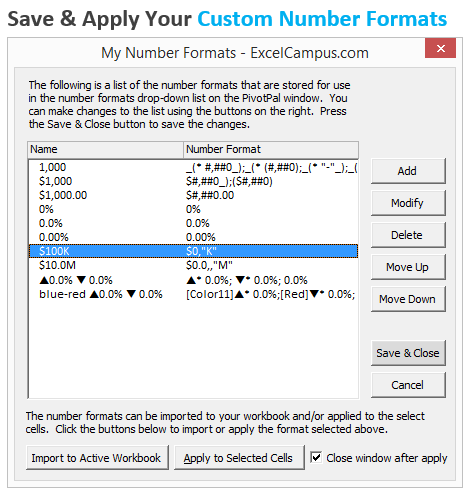 The My Number Formats tool also allows you to apply your favorite number formats to any cell in the workbook. It is not limited to pivot tables. If you are constantly adding custom number formats like ($1.0M) to your workbooks, then this tool will allow you to do that in one click. I've added a new feature that automatically formats the numbers in the Values area of the pivot table when using the built-in Pivot Table Fields List. The Automatic Number Formatting feature detects the number formatting that is used in the source data range, and automatically applies it to the pivot table when a field is added to the values area. If the source data is not formatted, or does not exist in the workbook, then a default number format that you specify is applied to the pivot table. Either way, you will never have ugly looking pivot tables with the General number format. The built-in menus don't allow you to work with source data while building the pivot table. Unless your pivot table is on the same sheet as the source data, you spend a lot of time flipping back and forth between the pivot sheet and source data sheet. PivotPal solves some of these problems with a few great features. Often times you will know what field you want to add to a pivot table, but you don't know the name of the field. This is especially true when you are working with data that is exported from a database system. The field names aren't always descriptive. Let's say you want to add the field that contains the product groupings, but you don't know the name of the field. With PivotPal you would simply press the GoTo Data button on the PivotPal window. This will take you to the source data sheet, and the PivotPal window will remain open. You can then browse through your sheet or use Excel's Find menu to find the field. Selecting any cell in the column of the field will automatically select that field in the PivotPal window. Now all you have to do is press one of the Area buttons on the PivotPal window to add the field to your pivot table. It's that easy! Press the GoTo Pivot button to return back to your pivot table and view the results. When you double-click on a cell in the values area of the pivot (right-click> Show Details…), Excel adds a new sheet to your workbook that contains the rows of data that make up that slice (intersection) of the pivot. I call these drill-down sheets. This can be handy information if you are trying to investigate a number, but your workbook can quickly become cluttered with drill-down sheets. The other problem is that the drill-down sheet is not formatted, and usually difficult to read. PivotPal has a Filter Source button that will show the exact same results by applying filters to your source data sheet. This means you can investigate the actual source data, instead of a drill-down sheet. If you need to make changes to the data, then it is already filtered for the rows you want to see. And, your workbook will NOT become cluttered with drill-down pages. This feature has a lot of great benefits, and you will find yourself using it all the time. Did you know that there are over 30 different layout and options settings for pivot tables? We spend a lot of time changing these settings for each pivot table we create. Everyone has their own preferences, but applying these settings can take extra steps. PivotPal has a feature called My Pivot Layouts that allows you to create profiles with your favorite settings, then quickly apply them to any pivot table with the click of a button. Just selecting the layout profile you want to apply, and all the settings will be automatically adjusted for you. It will save you a ton of time! PivotPal is packed with features to help you get your job done faster. 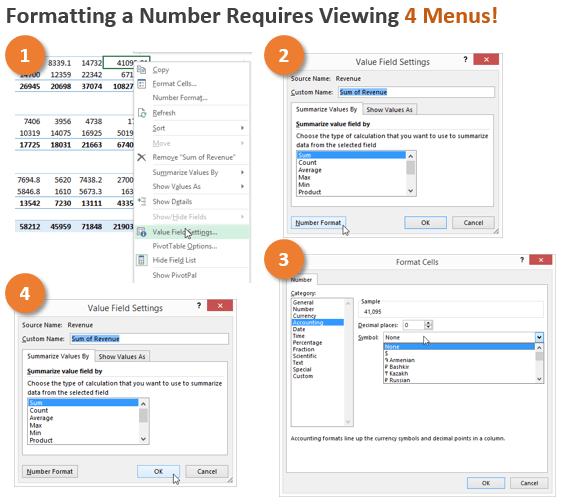 Apply Number Formats to Any Workbook – Your workbook does not have to contain pivot tables to use the My Number Formats tool. You can apply your custom number formats to cells in any workbook. Jump to any Pivot Table – There is a drop-down menu at the top of the PivotPal window that contains a list of all the pivot tables in the workbook. It also tells you what sheet the pivot table is on. This makes it easy to jump to the other pivot tables using the GoTo Pivot button. You can also quickly check to see which fields are used on other pivot tables by just selecting from the list. The field list will be loaded for the selected pivot table. Pivot Info List – The button to the right of the Pivot Drop-down opens a window that contains a list of all the pivot tables in the workbook. This list contains additional details about the pivot table including the pivot cache index number, source range, source type, and total pivot cache count. This feature will be enhanced in the future to include a lot more. 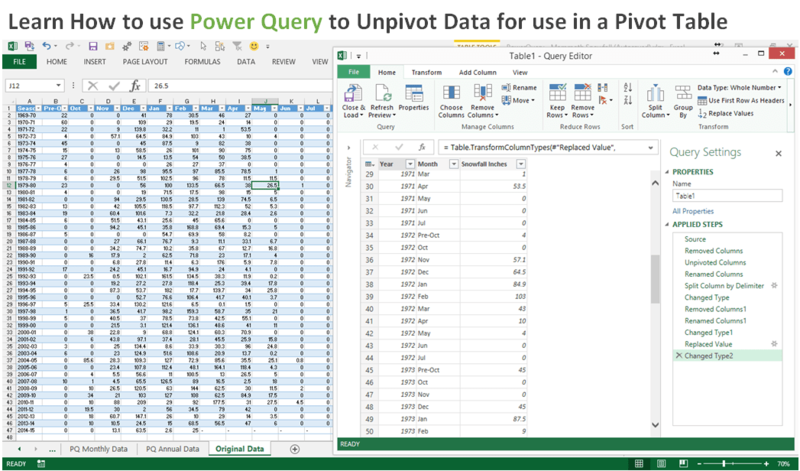 Works with PowerPivot – PivotPal will work with your Power Pivot models too. This saves a lot of time when searching for fields in many different tables. Function and Calculation Types – PivotPal contains two drop-down menus for the function (sum, count, average) and calculation types (% of totals, rank, etc.). This allows you to quickly change the calculation type of the value field(s) you have selected in the list. Yes, you can apply these settings to multiple fields at the same time. When selecting a calculation type, the name of the field is automatically changed to describe the calculation. Instead of “Sum of Revenue2”, the field will be named “Revenue % of Total”. This is something that Excel does NOT do. 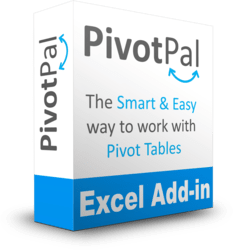 PivotPal will help increase your productivity, and alleviate some of the frustrations you face when working with pivot tables. 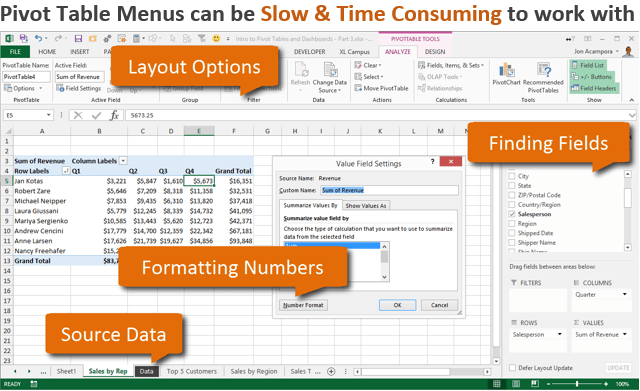 PivotPal is meant to compliment the built-in menus in Excel. It won't completely replace these menus, but instead it provides a quicker solution for some of the tasks we do the most. This time savings will allow you to spend more time on creative and analytic (fun) part of your job. Spending time on this type of work will make a bigger impact for your organization and your career. PivotPal is a great tool! It saves me a ton of time when working on unfamiliar data when I am creating a Pivot Table by allowing me to construct the Pivot while looking at the source data. That is an extremely helpful feature. Between constructing Pivot Tables while looking at the source data and being able to add more than one item at a time to a Pivot Table field saves me quite a bit of time. I really appreciate having been able to review the PivotPal ahead of its launch and its had a serious workout already on a Dashboard I’ve created for my company’s global use. Using the PivotPal has been quite a ‘light bulb moment’ in that it has helped to really cement my understanding of how Pivots in MS Excel work – quite apart from making Pivot Tables much easier and faster to set up, especially for multiple tables, it’s also helped me understand much better MS Excel’s high level Pivot Table workflow. As well as being feature rich PivotPal also uses the valuable screen and workspace real estate much more efficiently than Excel’s native Pivot management which has been a real benefit whilst developing my spreadsheet Dashboard in meeting rooms and on my sofa using just my laptop without the luxury of twin monitors back at my desk. PivotPal is an Excel Add-in that is compatible with Excel 2007, 2010, 2013 and 2016 for Windows. The Standard Version comes with all the great time saving features that will help you work faster with your pivot tables. With the Developer Version you get access to the VBA Source Code that makes PivotPal run. This is great if you are learning VBA and interested in developing add-ins or applications. *Licensing: This purchase is for 1 user license for the PivotPal add-in. You may install it on up to three computers that you own. Please do not distribute or share the files. *Note: PivotPal does not work on the Mac versions of Excel. 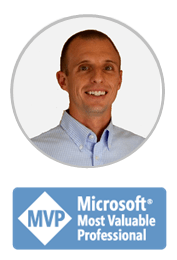 I am including some great bonus videos with PivotPal that will help you learn more about pivot tables, pivot charts, my new favorite tool PowerQuery, and the VBA code that runs PivotPal. In this three part series I explain how to create this dashboard of snowfall data. You will learn how to use PowerQuery to unpivot or normalize the data we download from the web. I copy some snowfall data from the website of my favorite ski resort, and it needs to be unpivoted (re-shaped) to be in the correct structure to use for a pivot table. This is also referred to as normalizing the data. And don't worry if you don't have PowerQuery yet. I also provide instructions on how to download and install it. This video explains how PivotPal works and we dive into VB Editor to look at the forms and code that make up the add-in. This will be helpful if you are new to VBA or add-ins and want to understand how they work. The bonus includes access to a special page that contains the video, and also contains a section where you can ask questions. Note: This bonus is only available if you buy the Developer Version of PivotPal. Can I install PivotPal on multiple computers? You can install PivotPal on up to three computers that you own. You cannot share or distribute the files. I accept PayPal and all major credit cards. Click the buy now button above to be taken to a secure checkout page. How do I get PivotPal once I make a purchase? You will be able to download PivotPal immediately after purchase. You will also receive an email with the download link and purchase receipt. PivotPal has a lot of features, how do I learn all of them? There is a dedicated help page for PivotPal that contains video tutorials and guides to help you learn the features. I want to get reimbursed by my employer. Can I get a receipt for the purchase? Absolutely, a formal pdf receipt will be emailed to you immediately after purchase. What version of Excel do I need? PivotPal is an Excel add-in that works with Excel 2007, 2010, 2013, and 2016 for Windows (both 32-bit or 64-bit). Will PivotPal be updated, and do I get these updates? Yes and yes! I will continue to add features to PivotPal as you request them. I already have a list of features I want to add, and look forward to getting feedback from you to help make PivotPal better. Can I undo the changes I make to my pivot tables? Not yet. As with all macros, the undo history is lost when a macro makes changes to the workbook. This is one drawback to automating Excel. However, I am working on a feature that will allow you to view your pivot table history, and undo changes. I recommend saving your file before making any major changes to your pivot tables. PivotPal is guaranteed to work. If you are unsatisfied for any reason you can get a full refund within 90 days of purchase. Plus, I am always happy to answer your questions and help you any way I can. An Excel add-in is an Excel file that contains VBA code (macros & forms). You install the file one time, and then it will open automatically every time you open Excel. Once PivotPal is installed, the XL Campus tab will appear in the Ribbon. This tab contains the PivotPal buttons to open the various windows. I want you to love PivotPal! If you are not completely satisfied for any reason, I will give you a full refund within 90 days of purchase. And yes, you still get to keep the add-in file. So you could get a refund and keep all these products for free. I’m hoping you don’t do this, and I probably shouldn’t even mention it, but I’m willing to take this risk in hopes that PivotPal will really help you. So try PivotPal for 90 days. I am here to help you with any questions. You can contact me directly if you need any helping using PivotPal. You will also receive installation instructions and there is an online help page with videos that will explain all of the PivotPal features in more detail. PivotPal is very easy to use and it will work for you! If I use this on my home PC and then go to another computer which does not have it installed, will the pivot tables still work as standard pivot tables? Just checking if PivotPal compatible with Office 365? You’re a great teacher. After viewing your free on-line videos (Parts 1, 2, and 3) I’m now going to purchase PivotPal. After viewing the free videos I have come to your website wondering what price your product would be. Finding it a very reasonable price I immediately decided to purchase it. In addition, you were not pushy about your product and I appreciate that. Can I use PivotPal if I use Office 365 (Excel 365)? Great job as always. Your examples are great and your narrative concise. I have been using Excel for years as a Senior Financial Analyst / MBA but I always learn something from you. I am trying to get a job as a finance manager at foreign company in myanmar. I have many experience local companies . But I need more smart presentation and want to get more confidence. During time I search excel trainings on Youtube . I Prefer your channel . Your video channel is clear . short easy to understand for me. I saved your video (off line video)in my i pad i try my laptop. All video are not finished yet . As your instruction I will start to learn VLookUp . Is this only for business? I am a school teacher and want to sort answers from different tests and into different classes. This would my staff which areas need improvement ect. VBA version vs your “regular” version, in layman terms what is the difference and how will I know what I need to purchase. I create pivot tables for my Manager who reviews and may or may not make changes, will they need PivotPal as well? Will this work with Power BI? Does Pivot Pal have an option to clear the Pivot Table Cache used for slicers and filters? I have had issues after doing data refreshes that the Pivot Table slicers and filters still show old data in the filter that is no longer there. I know there are some manual process to clear the cache, but a tool to ensure it is done right would be nice. I know you don’t have a Mac version of pivot pal. I have a question: can I use the excel file created on windows with PivotPal on my Mac or in a computer without PivotPal? Do you have a an office license for multiple users? I have version 1.0 of Pivot Pal. Is there a more recent, updated version? If so, how do I get it? Does PivotPal have a way to save setting for a pivot table already in a layout of interest? Meaning after you open Pivot Layout window in PivotPal all its fields are set to the current pivot table layout. Will Pivotpal allow me to create pivot tables with text instead of numbers. right now, by default and without VBA, numerical data values that are read as text because they have a text parameter in the same field, show up as ‘0’ in the value area. I have a similar question as John McCreary. I work in a team environment and for a Govt. entity. Is there a public sector type of license for multiple users? Since the license would be ordered, paid and installed by my employer, can those 3 licenses be used by 3 different employees and/or do separate licenses need to be purchased? If i purchase pivotpal developer version, and create workbooks on personal computer, to use at work with colleagues (more than 3) can they use the workbook I create with pivotpal without having add on installed on their computer? The pivot pal is allowed to install up to 3 computers. I have 1 personal laptop, 1 company computer & 1 Laptop and 1 tablet. I would like to assign 2 add in license to my personal laptop and tablet. 1 license share between with company computer and laptop. In this case, can I install at company computer and un-install from company computer and reinstall the add in to company laptop when nessacery. Can I withdraw this license to re-install to new company computer/laptop? Please advice. I am considering to purchase pivot pal + VBA if the add-in is flexible when I change company/laptop for company usage and personal usage. I am on microsoft excel for the Mac. Should i be able to use your free download? Thanks. Good day to you! i have a question. I already have the PivotPal Standard version, is it possible to upgrade it to Developer version? $37 for PivotPal Standard Version, how long I can use for this add? Being from Belgium and working a lot with grouping in pivots, does the filter source in Pivot Pal work also with non US dates (e.g 25/01/2017 instead of 1-25-2017) and grouped fields? What does the VBA version mean. I know this is a silly question to most however, I am a new pivot table user. I am thinking about purchasing Pivot Pal. I will be doing Pivot tables and reports for my leadership group. I want to thank you for posting the Pivot table videos on YouTube, they helped me to understand how easy it is to use Pivot tables and create dashboards. Does this also work with pivot charts? I am constantly changing field value setting from count to max and if this can effectively make max the default when I create a new pivot chart, this’ll save me an aggregate of hours per week I think. Thanks. Does this work with Excel for MAC? How do I sign up to receive your emails and work videos? If I have created a spreadsheet with a pivot table using your tool. If I send this spread sheet to a friend to use must he have also have PivotPal installed. He will not be making changes to the pivot table – only the source data and want to view the results. it works with PowerBI tables ? m javed and really your pivot table tutorial very helpful. i love it, besides your pivotpal had great values but i am not in a position to purchase it but i love it. Thanks for the tool. I am contemplating purchasing Pivotpal after having watched your Youtube videos. Could you please tell me if Pivotpal needs to be installed on the computer or if it can be run as a non-installation Addin? The reason I ask is because I am not allowed to install programs on my work notebook. Thanks for your question. PivotPal does NOT need to be installed on the computer. It is delivered as an .xlam Add-in file that you install through the Add-ins Manager within Excel. I do NOT package my add-ins with installers for this reason. A lot of companies do not allow you to install programs. So, the add-in file is just saved to a folder on your computer and then installed through Excel. Here is a page with installation instructions for the add-ins so you can see the process. Please let me know if you have any questions. Thanks! Your program, is to be installed on a computer in the corporate network, how do we get over the security concerns from IT? Great question! The add-in file is just an Excel file type that is saved on your computer and installed from within Excel. This does NOT require you to install a program on the computer. There is no exe file or installer. You will just save the add-in file (.xlam) on your hard drive and install it through the Add-ins Manager in Excel. I hope that helps. Please let me know what specific concerns IT has, and I will be happy to try and address them. Thanks! Everytime I open excel file, pivot pal is disappearing under Excel campus tab. I have also checked in the add-ins manager, its is installed. Please help me to fix up this problem. Because everytime I have to install add-in, its really annoying. This issue that causes the add-ins to disappear is due to a Microsoft Office security update. There is a fix for this, and you will need to Unblock the add-in. This is a new property of the file. The installation instructions that came with the add-in explain how to unblock the file. I also have an article and video that explain this issue and solution in more detail. I hope that helps. Please let me know if you have any questions. Thank you! Wow, I’ve not used a pivot table yet but feel that I need one! I just joined as a volunteer at Veterans Support Group, Inc.(501-c-3) charitable organization. They are using Excel and so far have entered a great amount of information and records. Can I install your Pivot Pal on top of Excel and have it work beautifully? I work at their office and also bring home work. I have Excel 2016 and they have Office 365 with Excel. Will I have a problem if I use your program on these two different Excel programs? If this will work out the way I wish, I’d order your big package tomorrow. BTW your videos are great. You’re an excellent teacher. It’s exactly what I would have done if I had your prior experience with these Excel time consumers. I’m disgusted that you beat me to it. Bravo! on a great idea and I wish you continued success with it. 1) Do all add-in functions work in the same way with regular pivot tables and with OLAP? 2) Is it possible to make several calculations over a single field (for example, sum and count) through the add-in and output both simultaneously? 3) Will the add-in work on Russian localization? Hi Jon (and Serg), I have the same questions as Serg ( 1 and and 2 that is ;). Especially question on working with OLAP. Your add-in contains the functionality I was looking for (for decades now). I’d like to hear from you. Hey Jon, refreshing a pivot table is relatively easy, of course, with Shift-F10/Refresh. But to improve productivity I try to eliminate clicks, or even keyboard shortcuts as much as possible. I have set my Excel files containing pivot tables to refresh on opening. In addition, I use a macro to refresh after saving the file so I see results after adding new data before closing the file. I have added this macro to each file with pivot tables, but a more “elegant” solution would be to have a “central” macro, so each file does not have to be saved as an .xlsm file. I have added the code above to the PERSONAL.XLSB in a module in the Modules folder. But it does not work. Should I put the code in the ThisWorkbook instead? If so, how do I handle it with some other code that is already there? Or would an add-in be more appropriate? I have looked how to create an add-in but somehow I can’t get it to work. Maybe you can point me in the right direction. And maybe you find it useful to add this to your PivotPal add-in? Great question! To run macros from the personal macro workbook or an add-in when events happen in other workbooks, we need to use application events. Here is an article by Chip Pearson on App Events. I use this technique in my List Search Add-in to trigger the SelectionChange event when the user selects any cell in any workbook. The VB Project is unlocked for List Search so you can see the code. Great suggestion on adding a feature to PivotPal. Thanks! Is there an eval version available? I’ve had many problems with Addins clashing, especially on 64-bit Excel. My current laptop has some issue and sooner I may choose to replace with another laptop. Will purchasing your product now and installing on my current laptop require me to purchase another set for my new one? Can you provide a prudent approach? Yes, you can install PivotPal on up to 3 computers that you use at any one time. So as you get new computers in the future, you can install it on those without having to buy another license. Please let me know if you have any questions. Thanks! Do the PivotPal slicers work for people without PivotPal? Yes, slicers will still work with PivotPal. PivotPal does not limit anything in the file. It is just an enhanced version of the Pivot Tables Field List and adds other functionality. You can still use all the built-in feature of Excel. Please let me know if you have any questions. Thanks! I do like the simplicity of building the pivot tables with PivotPal, and was excited about the dashboard slicers, my question is: Do the slicers work without PivotPal? The reports i create are for management. I have excel 2011, I’m guessing PivotPal won’t work. Any plans to include 2011? Correct, PivotPal does not work on the Mac versions of Excel. I do not have plans to create a Mac version at this time. The 2016 Mac version still does not have a solid VB Editor for which to test and deploy and add-in like this. Hopefully Microsoft will change that in the future. Sorry about that. i would like purhcase for company use at my own expenses but for for any reason if want to use for personal purpose in my own pc. You can install PivotPal on up to 3 computers that you use at any one time. So yes, you can use it on both your work and personal computers. As you get new computers in the future, you can use it on those as well. I hope that helps. Please let me know if you have any questions. Thank you! We have 12 people on my team at work. I am thinking PivotPal might help all of them. Would we buy 4 standard versions or is there an option to buy multiple licenses at one time? Will PivotPal also work with non English Excel versions? Do you sell a pack of all your add-ins? And is there also a option in PivotPal to find witch tab of my multiple Pivot Tables tabs thath contains a overlap to another Pivot Table? Thank you for contacting me. The majority of the PivotPal features will work in non English versions. I have had some users report that the GoTo Data button does not work in some non English versions. I don’t have a pack of add-ins yet. Pivot tables cannot overlap. Excel does not allow this. So I’m not sure I understand your last question. I hope that helps. Please let me know if you have any questions. Thank you! Is your add-in virus free? My apologies for not responding sooner. Yes, absolutely. There add-in is virus free. After purchasing you will download the add-in file from a secure site. Please let me know if you have any questions. Thanks!